One thing that has become very clear from the last few episodes of this first season of Star Wars Rebels (and James Luceno’s outstanding Tarkin novel) is that the Empire’s greatest loss at the Battle of Yavin was not the Death Star; rather, it was Grand Moff Tarkin. As we witnessed in Return of the Jedi, mobile armored battle stations (even the moon-sized ones) can be rebuilt. But a military strategist on the level of Wilhuff Tarkin is not so easily replaced. 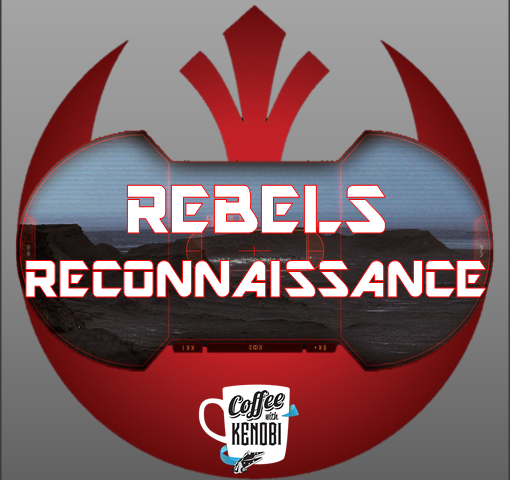 But as “Rebel Resolve” occurs at a much earlier point in the timeline, Tarkin is still in his prime and since his arrival on Lothal, the search for the rebel members of the Ghost has intensified to the point where Imperial AT-DP walkers have begun to roam the city streets in search of the so-called “insurgents.” Never ones to miss an opportunity, our heroes have decided to use the increased presence of the Imperials as a means of discovering Kanan’s location. Still held captive after the events of “Call to Action,” Kanan has gone completely off the grid and his friends are desperate to find him by any means necessary–even if it means getting Chopper into a mobile AT-DP so that the droid can access the prisoner logs for Imperial detention facilities. Unfortunately, the plan doesn’t work–despite the daring hijacking of the walker–because the data network is down. Tarkin has tightened things up considerably on Lothal and the crew of the Ghost will have to take extreme measures if they want to find their friend. Upon returning to the Ghost, the debate begins about what can be done–and should be done–to help Kanan. Surprisingly, Hera advocates letting Kanan go as the mission is too important to be “jeopardized for one soldier.” Having just spoken to Fulcrum, the Twi’lek pilot is taking her cues from her mysterious contact who advises the rebels to go into hiding after their very public pirate broadcast. The hooded figure (who we finally get a glimpse of but whose identity remains undisclosed) is troubled by the attention Hera and her group have garnered, but is even more concerned about Imperial retribution. It is an impossible choice to make, but Hera makes it anyway. Ezra, however, makes the opposite decision. Through the use of his burgeoning Force abilities, the young Padawan has sensed that Kanan is alive and decides to subvert Hera’s authority and attempt to find Kanan. The boy recruits the others to help him, and with Chopper acting as a diversion for Hera, sets off with Sabine and Zeb to find Cikatro Vizago. The Devaronian crime lord is none too pleased to see Ezra as the recent rebel broadcast has only made things more difficult for those engaging in illicit activities on Lothal. In order to entice Vizago into helping him, Ezra proposes that if Cikatro chooses to help, he will be owed a favor by a Jedi. As if to offer proof, the boy asks him to consider why the Empire would send an Inquisitor (an exciting implication that there are more of them) to LothaI if not for the presence of a Jedi. Incredulous, Vizago initially scoffs at the Ezra’s claim that Kanan is a Jedi–until the boy convinces him of his Jedi pedigree by Force-lifting a crate. Convinced, the devilish (in both appearance and disposition) Devaronian strikes a deal for intel and reveals that droid couriers are now the Empire’s primary method of transferring data on Lothal. Content to collect at a later time, Vizago finalizes his Faustian transaction with Ezra. A furious Hera awaits Ezra upon his return from the meeting with Vizago. Having disobeyed her direct orders, the boy is properly chastened for risking so much for so little. They might have a way to find Kanan–if he’s still alive–but the bargain with Vizago is a sure thing, and there is no doubt that the Devaronian will collect when it suits him. Because of the omniscient narration of “Rebel Resolve,” the audience does know that Kanan is alive, and scenes of his torture are embedded into the episode at frequent intervals. It’s a brilliant editing technique that keeps the tension high while Ezra and the others attempt to find their friend, and there is an increased urgency to their mission as we witness Kanan bravely defy his tormentors but also realize that time is running out for him to be rescued. While brutal, the torture sequences also feature highly enjoyable callbacks to classic scenes from both A New Hope and The Empire Strikes Back. When Tarkin walks into Kanan’s cell and remarks, “Now we will discover if you are the Jedi you claim to be,” one cannot help but also hear Vader’s similar assertion to a captured Princess Leia about revealing the location of the hidden Rebel base. The spherical interrogation droid also enjoys a reprisal in these scenes–and proves to be just as ineffective as it was on Leia. The Inquisitor is unsurprised by this failure as he expected the Jedi’s resistance to the probe. ** Pain is his prescription to Kanan’s refusal to speak and the Pau’an seems to relish finally getting his hands dirty as he begins torture the Jedi through the Dark Side of the Force. Even so, Kanan remains steadfast and finds the energy to mock his attacker. Unfazed, the Inquisitor shifts to more conventional means of torture and employs mechanical methods to send agonizing bolts of electricity through Kanan’s body. The tactic is clearly a nod to how Darth Vader tortured Han Solo in The Empire Strikes Back, and the reference is made all the more evident when Tarkin modifies Boba Fett’s line to utter, “The Jedi is no good to me dead.” Having reached an impasse, the decision is made to transfer Kanan to another location in hopes of accelerating the interrogation process. And this is where the disparate threads of “Rebel Resolve” start to come together. Thanks to a disguised Chopper infiltrating both an Imperial shuttle and then a larger communications ship, Hera and the others have made significant progress in locating their captured friend and learned that Kanan was being held prisoner aboard Tarkin’s Star Destroyer, the Sovereign. They’ve also learned the particulars of Kanan’s imminent transfer. He is to be taken to the Mustafar system (a place very familiar to fans of REVENGE OF THE SITH). The site of the epic duel between Obi-Wan Kenobi and Anakin Skywalker that doomed the latter to an existence entombed in the black armor of Darth Vader, Mustafar has since gained the reputation of a place where Jedi go to die. It is from this hellish locale that Kanan must be rescued and to where the Ghost is headed at the end of “Rebel Resolve.” The next episode, “Fire Across the Galaxy” is the first season’s finale and the stage has been elegantly set for a spectacular confrontation between the Empire and our small band of rebels. **This also begs the question as to whether or not Leia (as the daughter of a man with the highest midichlorian count on record) was using latent Force abilities to resist the mind probe in A New Hope. Amazing work as usual, Craig! Perfectly descriptive and if there is anything as good as watching Rebels it is reading your reviews.